I'm really exited about sharing this DIY. Seeing as we're moving into the house in a month or two I've started to think of a lot more home-based projects. A while ago I found this pin on pinterest and decided that it really looked like a pineapple. 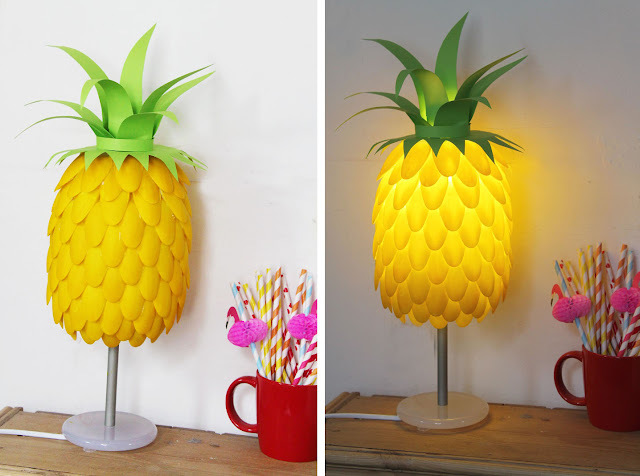 A pineapple lamp seemed like a really good idea and so I gave it a go. I can't believe how well it went! It was a really fast project; I had it finished in an evening and totally brightens up my room. 1. Take the lamp shade off your lamp and keep it unplugged until you have completely finished. 2. Using an Xacto knife cut off the base of your bottle and the spout so it is open both sides. 3. My bottle was a little long and so needed some shortening. I cut a chunk out of the middle and then gluegunned the two sides back together. 4. I then cut a few notches out of the bottle to allow it to fit over the lamp frame and act as a shade. 5. Using tough scissors or by carefully snapping them, remove the spoons from their handles. 6. Now paint your spoons. Surprisingly you can can just paint them using acrylic paint, but they do need two coats to make them look more opaque. 7. Start applying your spoons to the base of your bottle using minimal glue. 8. When you have finished start applying your second layer putting the spoons in the gaps between the first layers. 9. Keep on going until you get to the very top layer. This will use fewer spoon and so there will be bigger gaps between them. I did a second layer on top of this to fill in the gaps. 10. Now cut a spiny star shape out of your green card. Cut a hole out of the centre so the paper will not over heat from the heat of the lamp. 11. Carefully bend the spines over to shape them a little. 12. Using a glue gun glue the green star over the rough top of the spoons. 13. To make your spines, cut out spear shapes, apply glue to the base and apply to the inside of the plastic bottle. Again shape the leaves to make them bend over slightly. 14. When all of your spines have been placed cut them slightly to different sizes and finally shape to make them look perfectly pineappley!